“We don’t have to bow our heads and talk with the losers,” Mr. Yeap said. 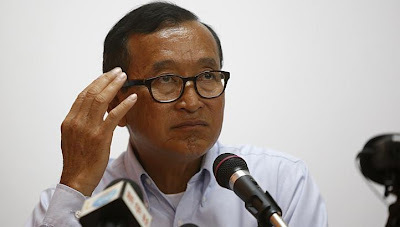 Opposition leader Sam Rainsy on Sunday said that the CNRP would formally appeal to the CPP this week to resume negotiations to end the ongoing political deadlock, but said that the CPP would have to meet the CNRP’s conditions for a new round of talks. “Now that demonstrations finished on Friday, we will respond to the CPP in the next few days,” Mr. Rainsy said, adding that the CNRP would put forward three preconditions for the resumption of talks. Firstly, the CNRP lawmakers will not take their seats in parliament, as demanded by the CPP, before the talks are held, he said. The nine-member National Election Com­mittee (NEC) must resign, he continued, adding that other government reforms must be based on recommendations made by Surya Subedi, the U.N.’s special rapporteur for human rights in Cambodia. “Before the start of any negotiation, we want the current NEC leadership to resign,” he said. “We want the CPP to agree that this discussion is not in the Na­tional Assembly, they must not think we will join the National Assembly first,” he added. As for a much-publicized election reform seminar that the government has scheduled for December, Mr. Rainsy said that it was not necessary, as various groups, including the U.N., European Union, the U.S.-based National Democratic Institute and the local Committee for Free and Fair Elections in Cambodia, have already put forth numerous recommendations on how the electoral process must be restructured to meet international standards. “We will tell the CPP there is no need to organize a seminar to gather opinions because the CPP knows many opinions have already been discussed by civil society. Let’s not waste time to collect opinions,” Mr. Rainsy said. 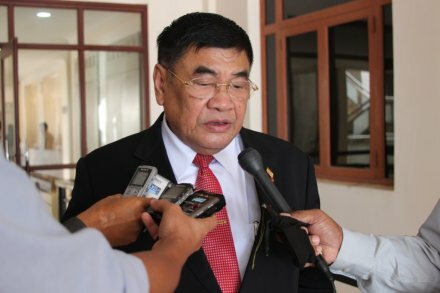 Cheam Yeap, a senior lawmaker and spokesman for the CPP, reiterated Sudnay that the CPP would not sit down with the CNRP for further negotiations until their 55 elected lawmakers have gone to the Royal Palace to swear in as members of the National Assembly, ending their ongoing boycott of parliament. “We don’t have to bow our heads and talk with the losers,” Mr. Yeap said. “We, the winners of the election, will not ask the losers [to resume negotiations] first, but the losers have to be flexible [if they want to continue talks],” Mr. Yeap said. After an initial round of negotiations, held on September 16 and 17, leaders of the CPP and CNRP agreed that the electoral system needed to be reformed. However, no specific reforms were settled upon, and the CNRP has had little success in its efforts to form a joint commission with the CPP to investigate the July 28 ballot. Following the CNRP’s three-day demonstration that finished on Friday, Mr. Hun Sen during a Cabinet meeting congratulated government authorities and CNRP supporters for avoiding violence during the protests, according to a statement released by the Council of Ministers’ Press and Quick Reaction Unit. “[Mr. Hun Sen] would like to ex­tend his admiration to the demonstrators and their leaders, who maintained good cooperation with all levels of authorities to avoid any irregular activities,” the statement says. The flip-flop attitude of the CPP is either the sign of their internal disagreement or the nature of their dishonest and dictatorial behavior. It is enough for having let these ignoramuses off the hook for thirty years to quietly destroy 70% of natural heritage causing calamity in the region. Got to love khmer, they never agree on anything. I don't like the CPP and I don't trust CRNP either. We need a new leader....May be the real khmer hero not born yet, that just too bad. THE MOOD, THE BAD AND THE UGLY!!! It looks like sam rainsy and kem sokha are playing a game with innocent khmer people who really 1,000,000% peace. ជយោ! សមេ្តចបណ្ឌិតអគ្គមហាសេនាបតីតេជោ ហ៊ុន សែន វរ្ម័នទី១ ជាទេវតានៃកម្ពុជា!!! CNRP will take their seats in parliament. If so, they are real real real dirsty DOGS. Sam Rainsy is a big dirsty DOG. If the CPP won election why the CPP is afraid from new inpartial comission, Ah CPP dog? In fact, you CPP is the real loser, not CNRP. Cheam Yeab not wrong CNRP is chicken play like kids not brave not stay on strikes always to the end of Peole need to be winner.Another thing that I wait and see Som Ransey never says a word on the crowed his winner or told Hun Xen to steps down that what I said a chicken a looser or a king supporter .KRANHUN EASAN. When the traitor Hun Sen congratulates you, you must be out of touch with Khmer people. This is the most crucial time in Khmer history, it requires the leaders to make bold decision and ultimate sacrifice. If you are a chicken, you need to transfer your task to others who are willing to sacrifice their life to save Cambodia. Khmer people must know how to deal with incompetent leaders. For example, in the CNRP, its committee members must compose with patriotic and competent people. Make sure that NO element of the Yuon slave in that committee. When people feel that under the current leader, the party will go nowhere but down hill, the committee must gather and pick a new leader. If the party were able to do this transition smoothly, the party will get stronger and stronger and the CPP cannot break the CNRP. Make sure that no struggle of power. Do according to the internal rules or regulations of the party. Put aside the personal interest, just keep the party stronger. Remember, NEVER move out of the party and create a new party. This idea will serve the Yuon and kill Cambodia. We do something to improve the party. That one new thing that Khmer people must learn and adapt. PS: Change the way you make that demonstration. It is not working. 'Tested Comment' has been approved! Sam Raingsy and khem Sokha , stop doing politic in Cambodia any more, pack your bags and go get a life. You both are chicken, you are irresponsible, incapable to run the country, I can see now. 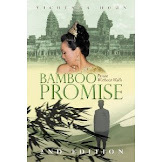 Let somebody else who brave enough to kick ah Hun Sen, ah China and ah youn Hanoi out of srok khmer. You both wasting the time too long to save the country. Khmer people has already woke up but you put the wall to block them. You both have failed and betrayed the people who supported you. ពួកបណ្ដាញឃាតករបម្រើយួន សម្លាប់ខ្មែរ ប្លន់ទ្រព្យរាស្ដ្រ លក់សម្បត្តិជាតិ បំផ្លាញធនធានធម្មជាតិរបស់ខ្មែរ​ត្រូវតែចុះចេញពីអំណាចជាដាច់ខាត! បើយើងមិនងើបឈរតស៊ូរប្រឆាំងនឹងរបបផ្ដាច់ការណ៍ទេ គ្មាននណា៎ប្រគល់សិទ្ធសេរីភាពឲ្យយើងដោយងាយៗទេ ព្រោះឥពួកគេមិនចេះស្កប់ស្កល់ យកតែប្រយោជន៍ពីរាស្ដ្រ ទៅស៊ីស្រួលដេកស្រួលតកូនចៅតែគ្នាវាហ្នឹង! To take oath and to take seats at the Cambodian parliament already means to legalize CPP election fraud. Is that what CNRP want? Oh! Chhiem Yaab , you are out of touch with reality. Cambodians demand that you respond to, but via Mr. Sam Rainsy. He seems to ignore people interest but party and his interest alone. Poor old retard!. Let the illegal CPP government do what it tries to do, i.e., forming a government and passing the law on its own without the participation of the opposition. As a matter of fact, as time moves on without the participation of the opposition, the CPP government of Hun Sen is getting more nervous. It will never get enough recognition to walk freely on the international stage and for that reason it won’t get enough revenue to make reform to its own advantage. CNRP needs to seek justice for the voters by finding an answer to the question of “Where is my vote?”. Be careful not to give the CPP the support it needs with nothing much in substance received in return for that would lead the CNRP to its own irreversible demise. The CPP has already thought of using the opportunity of ruling for another term to make enough reform to regain its popular strength. One would imagine that the CPP would increase the meagre salaries of the security forces and its current low-level frontline officials just enough to make them think twice if they want to change a master, not because it cares for them, but to win their continued loyalty. This loyalty serves as an effective weapon against ordinary and poor people who want to uproot the government. Remember that Cambodians, in this case the security forces and officials, don't seem to be able to look at and think of the whole picture and the future of the country; give them a few golden stripes on their shoulders, small amount of money and guns and they will serve you to the end; just look at the CPP high-ranking officials and Hun Sen who serves our neighbours to the east for their own and family benefits. 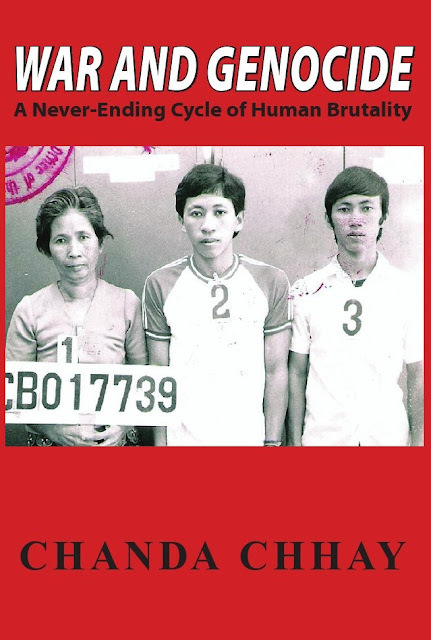 Unfortunately Cambodians tend to be each to or for himself or herself regardless of the consequences to the society and the country in which they live. Without some sort of support from the poor and low-level security forces and officials to help the protesters, it is difficult to challenge the power in place, but not impossible. It appeared that such a support had been in place before and around the election time. How much such a support remains now is anybody’s guess since these people now begin to realize that perhaps their future rests with their strongman! CNRP has been too soft in its approach to seek justice for the people. It has lost a lot of precious time and opportune moment, while the plate is still hot, to strike at the heart of the CPP. CNRP knows that it was unjustly deprived of the election victory and thus should have been much more resolute and aggressive in its fight for justice since it has an unprecedented popular support for a good fight. The approach used so far will only work with real and conscientious leaders who see the interest of the nation above theirs, but CNRP is dealing with thugs in formal suits that could not care less about their society. Imagine America trying to talk some sense out of Saddam Hussein; how far do you think such an approach will go with Saddam? It is rather a wild dream to think that one can pressure Hun Sen into subordination with the kinds of demonstrations done so far; if they do anything, it would only reinforce Hun Sen’s belief that he can hold on to power by showing off his security forces since the opposition does not have what it takes to seriously challenge him. In the days to come CNRP will face more challenges and pressure to accept what the CPP can offer on the table. Personally I feel that the CNRP should stick with their current demands and not yield at all to CPP even though it means staying out of the parliament for a long time. If the popular support is not waning and the willingness of the supporters is the same or even higher, then continue with the struggle with, this time, real demonstrations urging people to defy the authority and be prepared for the confrontation. Cambodia will never get a peaceful transition as we hope for; transition to better government, freedom, and democracy will come at a cost; are Cambodians prepared to accept the cost? If not, well then we will have to live under Hun Sen and the CPP for another 5 years with a wishing thinking that things somehow will change for the better. Rainsy will bow his head to the CPP, what a loser. 5 more years, VC's plan will be fulfilled .e.g by sending more illegal immigrants and then, we will be out numbered. But hopefully, the Chinese won't allow that to happen e.g in 1979 the Chinese attacked the North VN demanding the VC to withdraw from Cambodia and so, whatever the VC does, it will be a clashed between these two nation of wanting the same piece of cake (Cambodia). So, unless they are agree up giving part of the North to the Chinese and in return the VC would take the whole Cambodia under their wings. Well, whatever the reasons maybe, these two nations are the main factors affect our lives. Their evil tactics and tricks are plentiful (espansionists), born to steal, rob and kill. bad attitude to have. in dialogue, you have to be cooperative and polite. how about learn how to work and get along with others, this means both sides, the cnrp, too! CHHEAM Yeap, CHIEN Vun, Phey si PHOM are all the same. They are all Hoon Xen's CHIENS! Hoon Xen is Viet Cong's CHIEN! His hands are full of KHMER's blood. 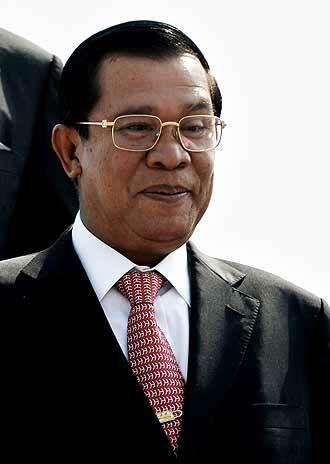 He is the killer killing Khmer for yourn to hold his power! ត្រូវចាំណា សមេ្តចបណ្ឌិតអគ្គមហាសេនាបតីតេជោ ហ៊ុន សែន វរ្ម័នទី១ មិនមែនជាមនុស្សលោកទេ សមេ្តចជាព្រះបាទ ហ៊ុន ទៀន ចាប់ជាតិ សមេ្តចជាព្រះបាទធម្មិក សមេ្តចជាព្រះអាទិទេព សមេ្តចជាទេវតារស់មកសង្គ្រោះប្រជាជនកម្ពុជា និងប្រទេសកម្ពុជាឱ្យ សម្បូរសប្បាយ រង់រឿង និងសុខក្សេមក្សាន្ដ!!! when they talk, they should always refer to the existing law, rules and regulations, the rule of law, etc. yes, make reference to the existing law when talk, this way, people can be reminded to stick with the ethical code of conduct. submit your opinions, and make suggestion and recommendation, etc, not telling other do it my way or the highway or what have you. be professional and use ethical code of conduct. that's how people deal or communicate with each other in government all over the world. otherwise, some people can be too opinionated which is unprofessional and unethical, to say the least! use the code of conduct when deal and communicate in gov't with each other. everybody can use training and continue education to improve self, skills, etc. it's ok. don't be ashame to learn and do better. communication skill is important to learn because in the real world out there, it is necessary and important! in this case, usually the party who won the majority have a little more leverage when dialogue. so be flexible and learn to listen, too, not just talking, listening is a skill, too. we all have to learn to listen before we talk. otheriwse, you miss the point the other trying to convey to you if you fail to listen. take turn talking, don't talk over the others, listen, then talk and express one self. it sounds easy, but not easy to do, that's why it is a skill to acquire! most skills must be learned. who is the real loser ah yeap. ah yeap is the real loser scare the truth. Your giving prominence to a quote from Chiem Yeap instead of the policy position of CNRP shows you are still green when it comes to fighting the media battle against CPP. When will you stop scoring your own goal and wise up a wee bit? The real loser are the poor khmer, beause of khmer leader don't get their act together. Cpp just admitted you are thr real looser. Who close the door and do business as usual? Very disgusting indeed. Currently our country is not the same as before! CNRP is a real looser. Won nothing till now.